Being informed of postpartum body changes means a healthier you—and baby too! Your body undergoes a major transformation during pregnancy—and an equally major one after labor and delivery. And while there are plenty of blogs and websites dedicated to week-to-week information about your burgeoning belly, your health and body after baby often get overlooked. While the rapid changes of pregnancy certainly slow down after you have given birth, and your body will eventually feel like it is back to “normal,” it will continue to experience changes for months postpartum. So, what are the things you should look out for, how can you decipher what’s normal and when you should call your health care provider? One of the most common questions women ask after giving birth is how soon they can expect to lose the baby weight. Many women were shocked to see photos of Kate Middleton after the birth of her first child, still embracing a fuller stomach. While it’s important to know that your weight will go down after pregnancy, it won’t happen overnight. During the first week after birth alone, you’re likely to lose between four and six pounds of pure water weight, and if you are breastfeeding, you can expect to lose even more weight, as nursing burns 300-500 calories a day. Your stomach will look quite baggy for the first two weeks after birth (and possibly longer) because it has expanded so much to accommodate a growing baby. By the time you go into labor, your uterus is 15 times heavier than its pre-pregnancy size, and what goes up must come down. As the uterus contracts, the stomach will return to its old size. Be patient with your body, set realistic expectations for weight loss, and speak with your health care provider to determine an achievable weight loss plan. A healthy diet helps, and once medically cleared, gentle exercises will get muscles back to where they were. While most women are excited that pregnancy gives them a brief respite from their monthly period (it usually returns in six to eight weeks, unless you are exclusively breastfeeding), whether you gave birth vaginally or via C-section, you will experience postpartum bleeding. After birth, you will bleed quite heavily for about a week; the bleeding will be frequent and heavy, and bright red in color. This is the body’s way of shedding the lining of the uterus and any excess blood and is entirely normal. After the initial week, any blood will fade to a rusty brown color and become less heavy, until it eventually stops. However, clots bigger than a quarter or prolonged, heavy bleeding after six weeks can indicate the risk of a postpartum hemorrhage and you should contact your health care provider immediately. Take note, it is possible to become pregnant again while you are still experiencing postpartum bleeding and before you have your first “normal” period, so be sure you have a plan for birth control in place. While most women focus on their physical recovery, you should also pay attention to your mental recovery postpartum. Emotions are often fragile in the weeks after birth, and studies show that up to 80 percent of new mothers feel weepy and irritable after giving birth. These emotions are understandable, as your body, home and personal life have all undergone major changes in a rapid timeframe. However, if these emotions persist past the ten-day mark, speak to your doctor to determine if you might be suffering from postpartum depression. 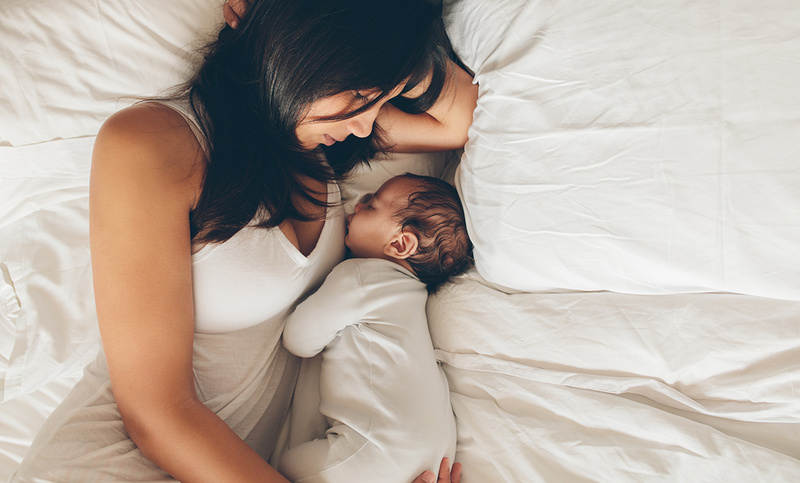 In addition to feeling emotional, many postpartum women will also feel scatter-brained and forgetful—all completely normal, given that new mothers are faced with a lack of sleep, multi-tasking and the general busyness that comes from being a mother. Besides the most common and obvious bodily changes, many postpartum women will also experience hair loss, are more susceptible to cavities and gum disease, dry eyes, facial pigmentation discoloration and have iron deficiency linked to low iron levels. All these things are usually temporary and can be addressed by your doctor. Postpartum can be an exciting, but overwhelming time in a woman’s life. Just because you have given birth does not mean your body has stopped changing, and the symptoms mentioned here are not an exhaustive list. Knowing what to look out for in the weeks and months after birth ensures you and your baby are both happy and healthy. You’ve got a lot on your plate. If you have questions or experience any concerning symptoms after your baby is born, contact us so we can help.